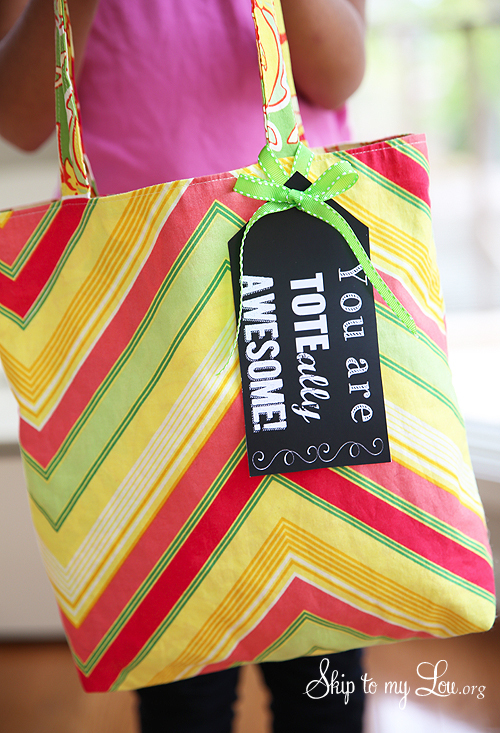 You can make this “tote-ally awesome” teacher gift! Simply whip up this easy reversible tote in your favorite fabric and you have a useful and thoughtful teacher gift! If you are short on time simply buy a fun tote. Don’t forget next week is Teacher Appreciation week! Click through my teacher appreciation series for amazing and easy ideas and you will be totally prepared to thank a teacher! 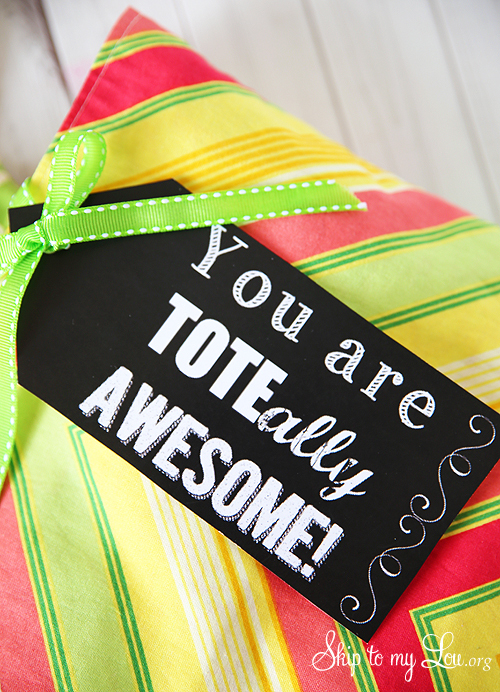 This gift is so simple just tie this cute printable tag on it, any teacher would love it. Here is another easy tote bag tutorial, this one is simple enough for even the most beginning sewer! Stop by to enter the Show your Appreciation giveaway today (you get a new entry each time your visit our guest blogger)! We are giving $1,000 from Michaels! You won’t want to miss this! I was also wondering what fabric you used to make the bag? It is adorable! It will make for perfect and unique teacher gifts this year. Thanks! Hi Britany, it is an older fabric from Heather Bailey. What kind of paper did you print the "you are totally awesome" tag? So cute! Thanks so much for the tute and tag printable! These are perfect for teacher appreciation week! Can you tell me which fabric you used to create this bag? Love this cute printable! I'll be using it. Thanks! Made this today. Also made a zipper pouch and used ribbon to attach them together(sewed it into the seams of both). I know my kids teachers will love them. Thanks for the great idea! I am thrilled to hear this. Thanks for telling me.